If the authority of scripture is superseded but a little, religion/relationship between God and man can become morphed into superstitious ritual and idolatry. And when salvation made to be earned [which also is contrary to scripture (Romans 3:23-24, 4:4-5 & 10:1-4)], that's when the spirit of the law fades beyond memory, and religion becomes legalistically abusive (Matthew 23:23, Mark 2:27, Luke 11:46, Matthew 15:1-6). 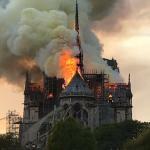 So the temple of the living God (1 Corinthians 6:20) and the church (1 Timothy 3:15) has since then been made into a physical temple again; as if He needs or requires it (Psalms 50:12). The earth is his foot stool the heavens his throne so he doesn't reside in their cathedrals, mega churches,or small hen houses. And what God blesses or creates as a home will never be able to burn rust or wilt. Good point of view(truth) you have. Most throw it away by the wayside and they walk away from the path of life. But this is the truth he chooses us to be part of him we do not choose him. (there is scripture to back that also. )many are called few are chosen. I would dare to eager you are chosen if you are in the truth like you seem to def be. 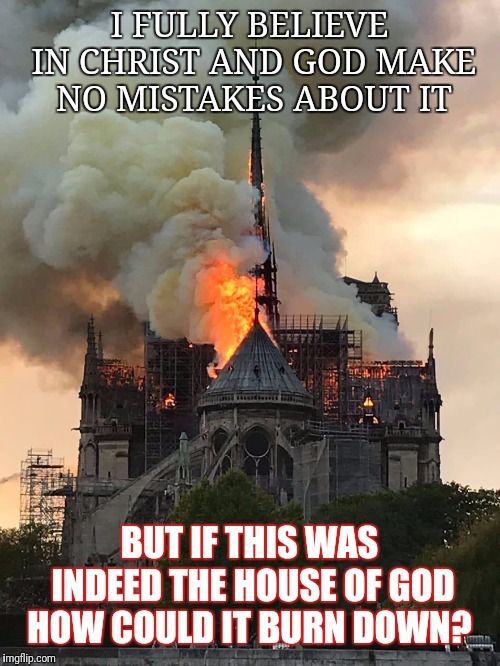 I FULLY BELIEVE IN CHRIST AND GOD MAKE NO MISTAKES ABOUT IT; BUT IF THIS WAS INDEED THE HOUSE OF GOD HOW COULD IT BURN DOWN?